By Mark Lattimer, Shabnam Mojtahedi and Lee Anna Tucker, for Ceasefire Centre for Civilian Rights / Syria Justice and Accountability Centre, April 2015. 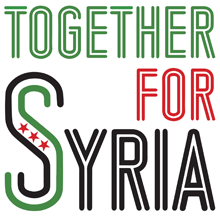 The war in Syria has been characterised by impunity at every level, local, national, and international, for some of the most extreme violations of human rights of current times. 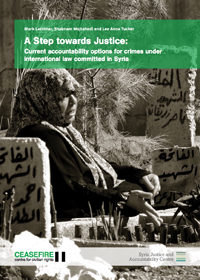 This report, prepared by Ceasefire Centre for Civilian Rights, and by Syria Justice and Accountability Centre, looks at the feasibility and potential impacts of different options for bringing some measure of accountability. The report was discussed on October 19th at an event in the House of Lords chaired by Baroness Stern. The speakers were: Mark Lattimer, Ceasefire Centre for Civilian Rights; Mohammad Al Abdallah, Syria Justice and Accountability Centre; Laila Alodaat, Syria Justice and Accountability Centre; and Nabeel Sheikh of Neumans LLP. Mark Lattimer, director, Ceasefire Centre for Civilian Rights, introduced the report. It outlines a number of legal avenues to justice for war crimes and breaches of human rights committed in Syria: the International Criminal Court; a Hybrid Tribunal; or criminal prosecution in foreign national courts. On the International Criminal Court (ICC), Syria is not a party, and without a UN Security Council Resolution the Court’s jurisdiction is limited. In May 2014, Russia and China vetoed a draft resolution to refer the Syrian conflict to the ICC, but despite this the ICC Prosecutor can investigate crimes committed in Syria by the nationals of any state which has signed up to the ICC, including most European countries. Many of these have nationals fighting in Syria, so ICC involvement is theoretically possible but to a very limited degree. 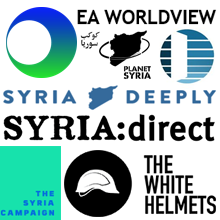 The second option considered by the report is a Hybrid Tribunal: this could be set up in a neighbouring state, or in a safe zone within Syria, combining international and domestic laws and processes. But states like Jordan or Turkey have taken sides in the conflict, and would not be regarded as impartial venues. It is unlikely that the Special Tribunal for Lebanon would expand its brief to cover the war in Syria. Nobody is undertaking the establishment of a safe haven, and with the Syrian opposition as host it would not be regarded as impartial. While both of the above options are therefore currently unfeasible, Mr Lattimer pointed out that Syrians are doing sterling work collecting and documenting evidence for the future. The third option, criminal prosecutions in foreign national courts, is the only option regarded as feasible in the current context. Mohammad Al Abdallah, of the Syria Justice and Accountability Centre, was more hopeful of the possibility of a democratic transition in Syria than was Mark Lattimer. He pointed out that Syrians have long experience of impunity after over forty years of the current regime. He briefly commented on the options covered by the previous speaker, noting that the Special Tribunal in Iraq was highly politicised, very expensive, and not regarded as successful. On criminal prosecutions in foreign national courts, he referred to the prosecution of a former Free Syrian Army fighter who had sought refuge in Sweden, and was sentenced to five years in prison by a Swedish court for for an assault in Syria that was filmed and posted on social media. While this raised objections at the time from some that only one side in the conflict was being targeted, it seems increasingly likely that cases of former regime fighters will also come before European courts. The influx of Syrian refugees to European countries represents an opportunity in his view, to engage Syrian communities as victims, but also to prosecute perpetrators of human rights breaches, in the European Courts. He has knowledge of an impressive dossier of pictures and videos linking some refugees in Europe with crimes committed in Syria, including crimes by regime forces. Although only perpetrators from the lower ranks were present in Europe, he believes that use of national mechanisms for justice within refugee hosting countries would send a hopeful message of accountability in the interim period. Eurojust is actively engaged in gathering evidence for such prosecutions. Mr Al Abdallah is passing on information received from Syrians in Europe, and anyone with such information can contact him directly at malabdallah@syriaaccountability.org. He warned however that the work of collecting evidence against Syrians in Europe carries risks, and should be done discreetly. On recent efforts by UN envoy Staffan de Mistura to negotiate a limited ceasefire or ‘freeze’ in Aleppo, he criticised the absence of any commitment to accountability in such proposals. On the possibility of future ICC prosecutions, he emphasised that these would only deal with a handful of high-profile cases, and that ending a culture of impunity required achieving meaningful justice within Syria. Laila Alodaat, though also a member of Syria Justice and Accountability Centre, spoke about her role in the Women’s International League for Peace and Freedom in documenting the particular suffering of women in the Syrian conflict. She said that although women have been centrally involved in the early demonstrations against the regime, and in numerous civil society initiatives, the militarisation of the conflict shrinks the space for women, and silences them. The war has had particular effects on women; for example, 74% of girls killed since 2011 have been killed by indiscriminate bombing. The health care system has been destroyed; 80% of deaths in pregnancy and childbirth could have been saved were it not for the inaccessibility of healthcare. The collapse of the legal system has meant that women have no recourse to justice. Justice can only be enforced by arms, but women have no arms. In addition, women have been targeted in particular ways under ISIS. Who opened the borders to them, and who gave or sold them arms? Now Russia’s intervention is aiding ISIS, it will bring ISIS to women in the villages of Syria. The question of accountability is crucial for the country’s future. Women have been central to the preservation of civil society during this war, and there must be places for them at the table when discussing the transition to peace. Because they don’t have the prominence of combatants, there is a risk of their voices and contributions being ignored. Answering a question on the contribution that refugees resettled in the UK could make to the documentation of war crimes, she reminded us that these were selected for resettlement because of their vulnerability, and should not be further traumatised by demanding their stories, unless they were freely given. She talked of how Syrians have been documenting human rights breaches from day one of the conflict. Nabeel Sheikh of Neumans LLP, acting for the family of Dr Abbas Khan, spoke about their efforts to obtain justice for his death while in the hands of the regime. He reminded us that Dr Khan, a British citizen, was a humanitarian aid worker who was arrested in Syria by the regime and spent 13 months in captivity, 7 of those months under the most severe torture. After his release was ordered, largely due to the extraordinary efforts of his mother, he died in a prison cell. According to the regime this was suicide—unlikely in a man just about to be released. The subsequent inquest in the UK found that he had been unlawfully killed. There are great obstacles to achieving any justice in this case: though the victim was a British citizen, the UK Government’s responsibility is limited by the fact that he was not acting as an agent of the UK. However if key individuals responsible are identified it may be possible to include them in EU sanctions lists for asset freezes and travel bans. The legal team is currently pursuing this new avenue of accountability against such individuals.